Faith Connections is an hour on Sunday Mornings (9:45-10:45 a.m.) to make connections with your brothers and sisters in Christ. Faith Connections is our Sunday morning learning time for all ages, from 9:45-10:45 a.m. Stay after the 8:30 a.m. worship service, or come before the 11:00 a.m. service, for Christian growth and learning. Faith Connections is an invitation to come and talk with your brothers and sisters in Christ, enjoy coffee and refreshments, and deepen your relationship with Jesus. The mission of Faith Connections is: Building and sustaining our faith community one relationship at a time. We offer coffee and treats every week at 9:45 a.m. in the Fellowship Hall. Visit with your church family, welcome visitors, and enjoy catching up with each other. Then the learning groups begin. We encourage consistent attendance for all ages at Faith Connections, but if your schedule doesn’t allow that, all of the groups are open to you to attend whenever you are able. There is always an open seat for you! The children’s Faith Connections class with Jeanne Coherd is open to preschool-aged children, together with a parent or caregiver. During Faith Connections Kids, Miss Jeanne shares Bible stories and helps parents learn ways to continue the conversations about faith at home. Preschoolers through 3rd graders are invited to take part in Faith Connections Kids. A learning group for 4th-12th graders meets with Pastor Paige in Classroom across from the Nursery. These Faith Connections Youth talk about life, school, friends, and the Bible, to learn how God is active in our lives. We have fun meeting each week and getting to know each other as we listen for God speaking to us. The youth also spend time together at various Youth & Family get-togethers throughout the year. The Adult Bible Study meets in the Fellowship Hall during Faith Connections. Pastor Eric, Pastor Gordon Simmons, and Chris Antonik lead discussion on various topics related to the Bible, faith, and life throughout the year. We hope you will come for the Adult Bible Study so you can learn from your brothers and sisters in Christ and offer your stories to encourage others. 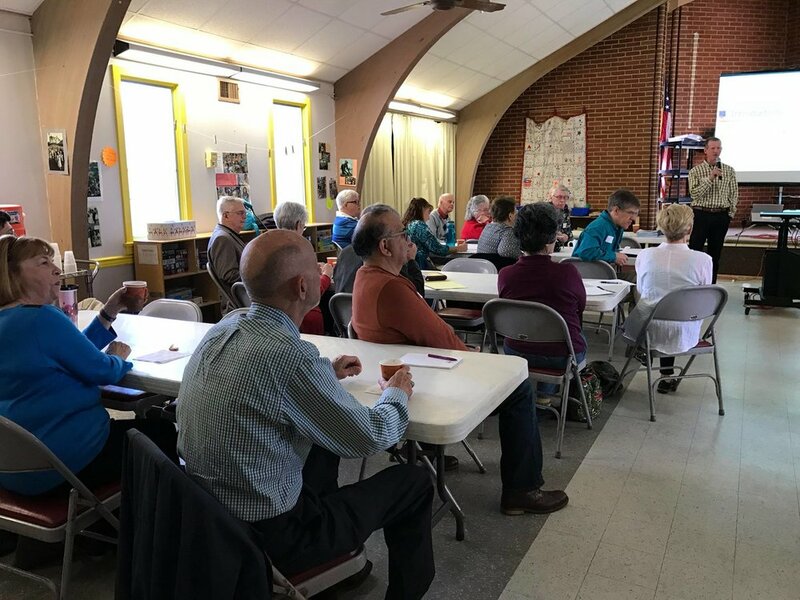 On the Sundays that we have ReCreation lunch and learning events, Faith Connections does not meet. Coffee and refreshments are offered for members and visitors to enjoy between the worship services every Sunday, but in order to gather as a whole church for ReCreation, we do not have Faith Connections on ReCreation days. Everyone: Coffee, refreshments, and conversation in the Fellowship Hall. Preschool through 3rd Grade, (Parents or caregivers with younger children are welcome to attend with their child): Faith Connections Kids with Ms. Jeanne in a classroom. 4th-12th Grades: Faith Connections Youth with Pastor Paige in the classroom across from the Nursery. Adults: Adult Bible Study with Pastor Eric, Pastor Gordon, and Chris Antonik in the Fellowship Hall. Faith Connections happens between worship services throughout the school year. Anyone is always welcome to join us any time! Please click here for a registration form for children and youth.